As Sam Darnold strolled through a room fluttering with media members interviewing some of the top athletes of their respective sport– Karl-Anthony Towns (basketball), Todd Gurley (football), Abby Wamback (soccer), Sydney McLaughlin (track)– he was relaxed and happy. He was home. After spending the past couple months in New York after being drafted No. 3 overall by the Jets in this year’s NFL Draft, participating in minicamp and learning about his new home, the San Clemente kid was back in SoCal for a visit before returning to the Big Apple for training camp. The night was about as stereotypical as it gets for Los Angeles– a cool 70 degrees with the sun setting gracefully on the water– and Darnold made his way around the Ritz Carlton in Marina Del Rey as one of the featured pro athletes at an event he wasn’t even a thought to get an invite to four years before. 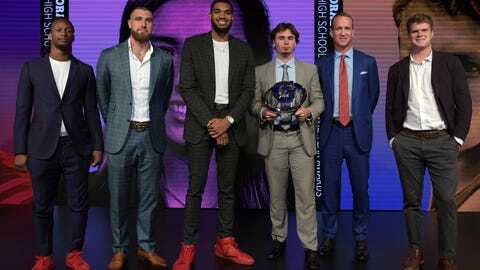 It was the Gatorade Athlete of the Year awards, honoring the top high school athletes from around the country in each of their respective sports. Now 21-years-old and a man who is set to earn north of $30 million over the course of his rookie contract alone, Darnold was ranked as a four-star recruit coming out of San Clemente High School by almost every scouting network out there, typically falling around the ranking of the 200th best prospect in the nation. However, while he wasn’t winning the National Player of the Year awards like the dozen of student-athletes currently surrounding him, he was winning the team ones. After losing the majority of his junior season to a foot injury, Darnold returned for his senior campaign with a mission on his mind. The dual-threat talent threw for nearly 3,000 yards and 39 touchdowns in 2014, while rushing for 785 yards and 13 touchdowns to lead San Clemente High School to a 12-2 record and the CIF-SS Southwest Division final. Those 14 battles on the gridiron, and the few that came before his senior year, are what he looks back on as the building blocks for his development into a future superstar. Although every single game was tough, watching him slip through perspective tacklers and demonstrating the calm attitude he is now known for would make any onlooker think differently. Just as he exuded the values San Clemente instilled in him as a blossoming teenager, he found the support he needed through his time at USC. Now in New York, Darnold finds himself in a similar situation to when he arrived on campus as a Trojan: a newcomer looking to earn a starting role over an experienced veteran. His time at ‘SC is well documented: dropping his first game as a starter when being called on in the fourth game of the season only to rally off nine-straight wins, including one of the most memorable Rose Bowl games of all time, then, as an incumbent, leading the Trojans to their first conference title in nearly a decade on the way to another New Years Six Bowl, the Cotton Bowl. Being placed in his current position is nothing new to the rookie and he is taking advantage of it the same way as he has in the past. Darnold says he’s competing, but also making sure to take the necessary time to learn the playbook and draw valuable insights from veterans Josh McCown and Teddy Bridgewater filling the roster with him. However, while the football may not be too different, the location certainly is. How can his acclimation while retaining his roots be put to the test? Simple. New York style pizza or In-n-Out? Though Darnold never went through the experience of being at an event like the Athlete of the Year ceremony, the young man who may be following in his footsteps as the next USC quarterback did. JT Daniels, who led Mater Dei to their third National Title and first Southern Section title since 1999 last season, was named the Male Athlete of the Year and will be competing for the Trojans starting role this year. Darnold, just three years older, believes his CIF compatriot is in a good position to leave a similar mark to his own on campus. Just as Darnold explains how Mater Dei prepared Daniels for his next role in life, he reflects on the upbringing that made him who he now is. So, while many of the other pros wandering the Ritz are using the award ceremony as an excuse to take a vacation to Los Angeles, Darnold moves on to the next group just happy to be home.